The Golden Dream (2013) – Diego Quemada-Díez. 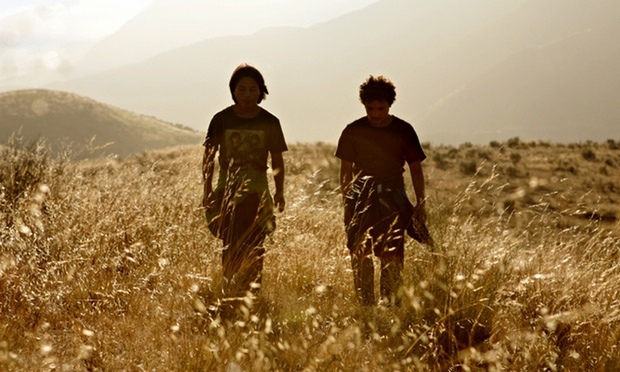 With a Bressonian flair and palpable tragedy, Diego Quemada-Díez’s The Golden Dream (2013) is a refreshing experience. The film deals with the journeys of three young people from Guatemala trying desperately to reach north America, drenched very clearly in some misleading propaganda surrounding the American Dream. The issue presented in the film isn’t simply one of escape but of false hopes and the eventual betrayal of those dreams by a variety of nasty characters along the way. The Golden Dream is Quemada-Díez’s debut feature film but seems far more mature than it should for a first attempt. Before this Quemada-Díez had made a handful of short documentaries about similar topics but, interestingly, had largely worked as assistant camera operator and a number of other smaller roles on Hollywood schlock such as Gone In Sixty Seconds (2000) and Swordfish (2001). The leap from these films to his doesn’t need stating. There’s no telling what Quemada-Díez would have done with budgets far larger like the projects he had been previously involved in. Unlike these Hollywood films, and several films from the big studios that deal with similar areas (though they are rare in themselves), The Golden Dream takes its notes from documentary in its portrayal of other countries and places. The shanty towns and dwellings of the three protagonists could have been easy fodder for the sort poverty tourism films that seem to do well in art-house cinemas in the west, but Quemada-Díez bypasses it easily to get to his characters; in spite of being a drama about a journey and the perils it throws up, The Golden Dream is a character piece hidden under the veil of an odyssey. The journey at first seems quite simple. 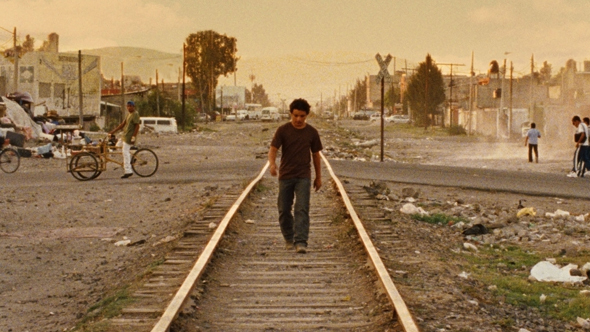 The three kids, Juan (Brandon López), Sara (Karen Martínez), and Samuel (Carlos Chajon), simply need to escape by a train that will eventually take them to the border. Yet this task in itself should give the viewer a hint of what trouble is to come. Even the mere challenge of jumping onto the moving train is presented as a tense moment, the lurching, hulking locomotive seeming to almost fall apart as it trundles along the track. At the next town, they meet an Indian boy, Chauk (Rodolfo Domínguez), who had been on the train with them. He can’t speak Spanish but latches onto them as a group in spite of Juan showing a racist attitude towards him (and later blaming him for their capture by the authorities). The character’s arrival begins the film’s drive towards character drama and the relationship/comradeship between people, but also its overall message of showing the brutalism that illegal immigrants face because of their vulnerability. Their capture and subsequent return to their town makes Samuel give up and the other three continue again in desperation towards the border. It seems their journey is fraught with abusive characters, from the authorities, to gangs and smugglers. The powerlessness of the characters becomes heartbreaking as they are put through squalor and hardship, all in the cause of reaching the American border. One side-story of interest in particular is the fate of Sara who, for the journey, had disguised herself as a boy. When the train they’re on is stopped by gangsters, all of the women are taken off in a lorry. Most films would provide some form of relief of her fate but, in true Bressonian fashion, Quemada-Díez provides no such contentment. She is driven off to her fate and that is that. The matter-of-fact nature of the film can make it a painful watch at times. The sheer youth of the characters and their inability (quite rightly) to deal with situations that even older generations would struggle with highlights the true plight of people that are so often maligned in the mainstream media. Refreshingly again, illegal immigrants are shown to be victims themselves on every front because of their inherent desperation and vulnerability. It would be surprising to find such open heartedness on the topic in a western film. As the narrative draws to a close, the casual brutality of the landscape and its people truly hits home, this time for the characters as well. The viewer, in a sad but necessary form of pathos, knows that the dream is just that; not that the journey is a physical impossibility, just that its end goal is far from the prize that Juan and Chauk have thought it to be. The strange visual of snow falling has been a constant juxtaposition throughout the film, seeming to come from no-where and in environs that are clearly intensely hot. As Juan walks back from his new American job in a meat-packing plant, it begins to snow and the fantasy that has haunted the whole film, becomes a reality. Sadly for Juan and many others, this reality is no longer the magical realm of the land of hope and dreams but the cold, simple reality that poverty of purse and of soul is everywhere and inescapable. The Golden Dream is released on DVD on the 10th of November. Transmitting Andy Warhol – Tate Liverpool.